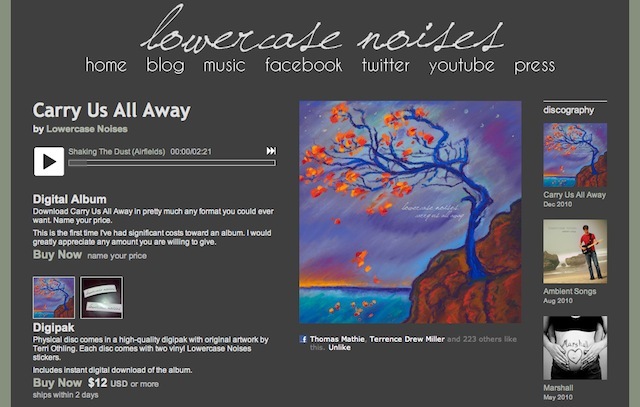 First up we have Carry Us All Away by Lowercase Noises. This is the first CD I have ever bought on Bandcamp... and, if Andy Othling's attention to detail and customer care are the norm on this channel, then it certainly won't be my last. The album itself is remarkable. I didn't think he could have bettered Marshall but he has... and the progression is evident. His guitar playing just gets better and better... and the introduction of drums is just so right... but, in addition, he has added to the mix some ethereal female vocals on the opening track and some heartfelt male vocals on the penultimate track... as well as some cello and oboe at various points in the hour long tour-de-grace that is Carry Us All Away. Frozen limbs I hold, hanging cliff my home, Winter claims my coat, shed to sea below. Pieces dwindle down, the frozen ocean sends them to the moon-tide shore, my year-long friends. Carried on the waves, embrace what needs to mend. 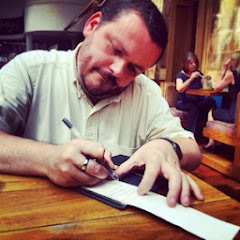 Troubles drift away, I want to live again. When we reach the shore, mangled, broken, sore, a bundled young boy gathers what none would want. Ugly, wet and cold, lifted where we lay, like sheep into the fold, he carries us away. Carried in those arms, embrace what needs to mend. Troubles do no harm, we want to live again. Death can have no sting, and as we leave we sing. Whilst the album is pay what you want, I would recommend owning the CD - Terri Othling's artwork is a pleasure is view up close... and the stickers are a nice wee touch too. 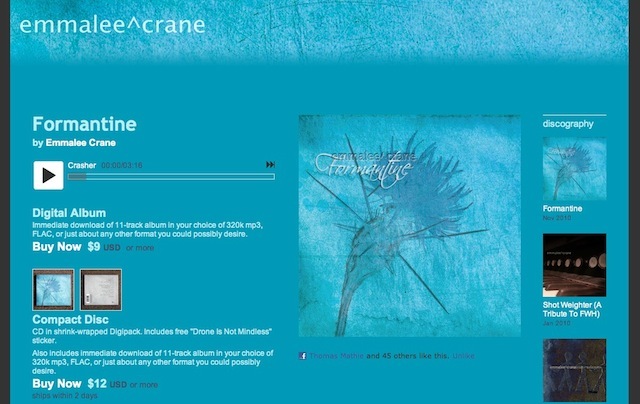 There is something wondrous and evocative about the timeless soundscapes on Formantine by Emmalee Crane. This is ambient music at its very best... with such harmonious resonance and a just-right synergy between traditional instrumentation such as the piano, oboe, clarinet and English or French Horns; and electronic "manipulation". I can only dream that this is the future of "classical" music. I know its not because this album wouldn't be deemed safe and marketable... but, if I were to dream, I would see a world of future-thinking imagination and creative expression... one that isn't afraid to take risks and look for beauty and grace in some unlikely places... one that places emphasis on collaboration and experimentation... one that doesn't seek repeat the safe of the past. This album gives me hope for the future. Worship is an important part of being a Follower of Jesus... but, for me, most worship / gospel music leaves me cold and uninspired. I believe it should not be about us, the messenger, but the message, the good news. I guess this is why the majority of music in the worship / gospel genres leaves me so cold and why A Hymn Revival by The Lower Lights takes me to another place... a joyous place... and revives my soul. 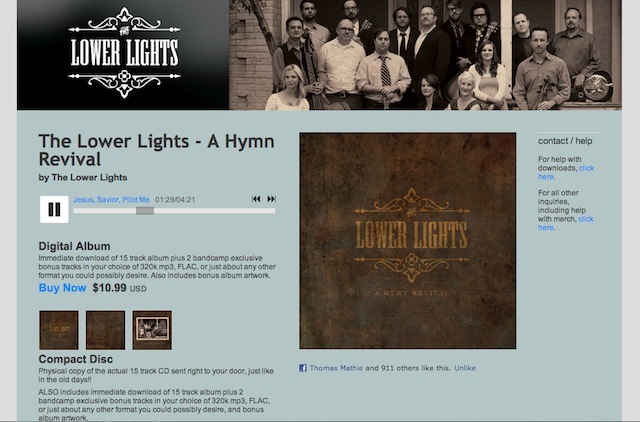 The music of The Lower Lights is truly a celebration and this is seen through their selection of such a wonderful collection of celebratory hymms... sung with feeling and enthusiasm. 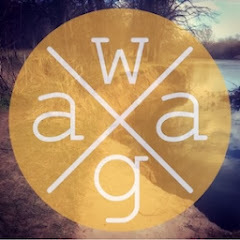 Theirs is a raw and organic form of gospel-inspired folk music... that is more passionate than perfect... which reminds me (just as Johnny Cash's American albums did) that it is in our humble human-ness and imperfection that the true beauty of the gospel can and should be expressed... and accessed. $10.99 for the download or $11.99 (plus postage) for the download and the CD. I plumped for the download and CD.